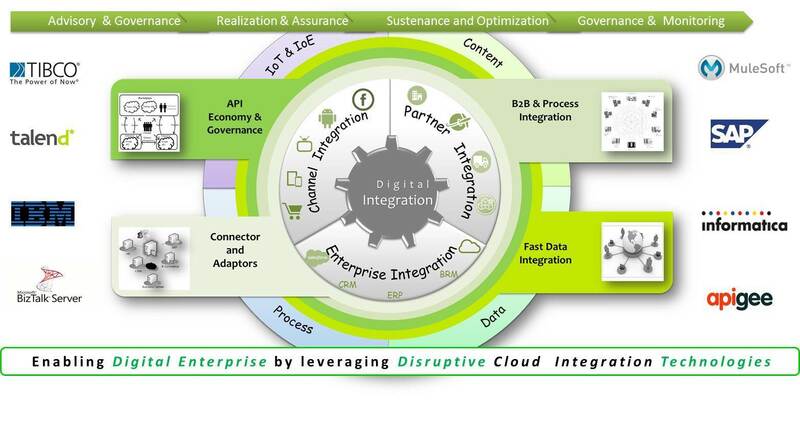 Digital Enterprise Integration is a critical and significant service in the IT Sector. Integration with external partner systems or internal disparate systems from a business and IT perspective are required to leverage the benefits of being a technologically advanced organization. Areas like availability, scalability, reliability need to be addressed by Integration backbone of the IT services seamlessly. With the spur in Digitization, organizations need to rapidly adapt to the changing technology landscape by implementing latest disruptive technologies. Companies need to transition from the tradition integration mechanisms to a digital integration with improved efficiency, security, customer experience and performance. This transformation should be achieved with zero compromise in the functional necessities of the business and with all probabilities that bring additional business value in this modernization exercise. Implementation of SOA/API based B2B along with MSFT, EDI, Sterling Connect. Channel Integration through API Gateway for IOT & IOEs.